The ways of achieving high quality photos and videos are becoming a thing of the past. Over the last year or so, the buzz has been all about drones--and for good reason. Used for a multitude of reasons, drones are becoming the wave of the future, and if you don’t get on board now, you may just get left behind. Read on for 5 pros of utilizing drone footage for your West Virginia business. One pro that using a drone to shoot your footage offers is the price! Who doesn’t love to save money? There is a lot that goes into producing a business video for clients: time, resources, money, to name a few. And for good reason, as it is a usually large investment for companies to help aid their brand’s identity. Drones not only help enhance the quality and appeal of these videos, it does so as a much cheaper alternative than the one in years past. It used to be that the only way to manage breath-taking, aerial shots was to hire a licensed pilot to get the shots from a helicopter’s view. As you can see, this process is far from cheap. A drone allows you to weed out the middle man and capture that same birds-eye-view shot on your very own, while saving big time. While using a drone, it allows you to not only capture everything you need to for a shoot on your own, it also offers a level of versatility unlike anything before. As previously mentioned, the best, most efficient way to achieve aerial shots was through hiring a licensed helicopter pilot and videographer. Not only does that limit you in the pocket book but also in terms of the areas in which you are able to shoot. Drones are able to maneuver in and out of tight areas that a helicopter could only dream of reaching. Aside from the variety of places a drone allows you to shoot, the versatility of the shots is what impresses me the most. While in the air, drones have the ability to rotate and move in all directions using just the touch of a button by the pilot in order to achieve the perfect shot. There’s an old saying that still is often used today that states, “Time is money.” While a figure of speech, sure, there definitely is some truth behind that statement. With a drone, teams can consist of just two people, the pilot and camera operator. With a team of that size, set-up and time to launch becomes exponentially faster. Not to mention that if there is trouble with weather, it is beyond feasible to simply land the drone and prepare the shoot for later when the weather has cleared or possibly another day. With a helicopter crew and multiple team members, encountering a weather delay could be disheartening as finding another time that works for everyone could be tedious and push back the deadline of a project. One pro of drone usage that cannot be overlooked is the overall quality. With the advancements in technology, being able to capture aerial videos without having to sacrifice quality is quite the asset. You can use drones to enhance your video. These videos are more likely to leave a lasting impression on the viewers as opposed to the normal stock footage shown on daily commercials. In advertising, lasting impressions are the goal, which is why the quality produced from drone footage is not to be overlooked. One area that is greatly benefiting from using drones in video production are businesses. That’s right! Construction: They can provide an overview of a project to clients and see things from a perspective unlike ever before. Real estate: Has the able to show the entirety of the land for sale and the perspective of what the property looks like in true size and layout. Healthcare: Can show the gorgeous landscape of the surrounding areas while outlining their services as if to show that our problems are small and our world is massive. To learn more about video production at InnerAction Media, click below. Austin Jones is a 20-year old sophomore at West Virginia University. He is an aspiring entrepreneur studying strategic communications. 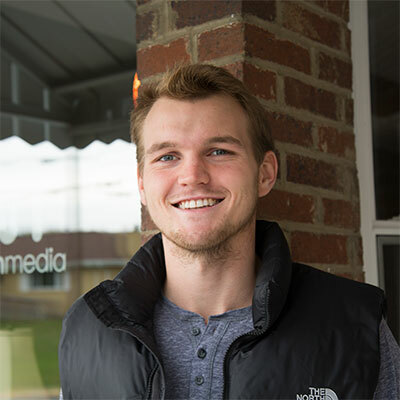 At IAM, Austin develops blog posts for our clients, manages social media accounts and nurtures clients through email marketing. In his spare time, he has a passion for health and fitness.